The St. Petersburg Times in Florida wrote of Carter: "The man adjusting his lens to take just the right frame of her suffering, might just as well be a predator, another vulture on the scene." The criticisms deeply disturbed Carter. Filmmaker Dan Krauss said, "In his famous picture of the vulture stalking the Sudanese girl," he started to see the embodiment of Carter's troubled psyche. "I believe Kevin did, too," said Krauss. 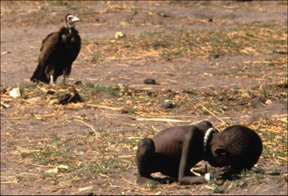 "In the starving child, he saw Africa's suffering; in the preying vulture, he saw his own face." Although Carter was struggling with numerous other issues of life, the haunting thought he might have done something for such a needy child, rather than just capitalize on an opportunity for the perfect picture, became more than he could bare. Only two months after winning the Pulitzer Prize, the 33 year old tragically committed suicide. Jessen said, "[W]e will have to give an account, as a nation, before God, for our apathy and for the murder of over 50 million children in the womb. Every time we falter in courage as individuals and fail to confront this evil, I wonder how many lives have been lost in our silence...How many children have died and been dismembered, and their parts sold, for our ego, our convenience, and our promiscuity? How many Lamborghinis were purchased with the blood of innocent children?" 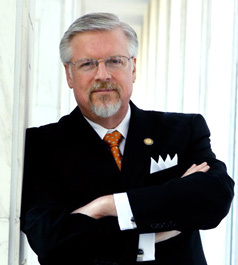 Pro-life warrior of many years, Jill Stanek, recently noted that "President Obama has a long-standing, super close relationship with Planned Parenthood, most clearly exemplified by his willingness in 2011 to shut down the federal government rather than allow the abortion giant to be defunded." Stanek adds, "If Planned Parenthood loses that funding, which accounts for 41% of its $1.3 billion budget, it will be severely hobbled, if it doesn't collapse altogether. It will certainly be in no position to help its political friends." Indeed, and so the vultures hover and lie in wait. In this picture some even spread their wings proudly, while vulnerable and infinitely precious infants have the abortionist's knife hanging over them. Dante Alighieri said, "The hottest places in hell are reserved for those who, in times of great moral crisis, maintain their neutrality." But it's not just the government that needs to do something about the wanton and wicked practices of Planned Parenthood. Each of us should ask ourselves, "What have I done to stop this madness?"